Gecić Law is a leading commercial law firm in Serbia. In 2017, the firm received a coveted “Top Tier” status as the youngest law firm in Serbia to achieve a Tier 1 ranking in competition law - a long established practice. The firm's professionals come from leading U.S. and European universities – Harvard, UC Berkeley, Queen Mary University of London, Florence EUI, KU Leuven, Maastricht, Nottingham, Panthéon-Assas and Carnegie Mellon, – and have extensive local and international experience, with a proven capacity to provide flexible, practical solutions even in the most difficult and highly complex cases. The firm's client portfolio ranges from multinational and national companies, banks and other financial institutions, strategic and financial investors, large State-owned Enterprises, SMEs and governments across the region. Owen Gleaton is a full-service law firm of 20 lawyers and 35 total employees. The firm employs a team of extremely talented and experienced lawyers, and is recognized as one of Georgia’s most respected firms in business law and civil litigation. Lawyers of the firm include a former President of the Atlanta Bar, President of the attorneys' ABA Fidelity Surety Committee, a Board Member of the Leadership Institute for Women of Color Attorneys and Georgia Lawyers for the Arts. 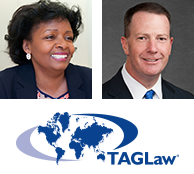 Karen Mason and Greg Noschese join the Advisory Board of renowned international alliance of law firms. Greg Noschese of Munsch Hardt Kopf & Harr, P.C. (Texas, USA). Various roles of the Advisory Board include assisting TAGLaw’s management in reviewing prospective new members, offering feedback for the planning of international conferences and providing valuable guidance on future plans and initiatives. The Advisory Board holds meetings at TAGLaw’s semi-annual international conferences.